The Bleu Dahlia is the brainchild of designer Anh Tran. Her innate talent for art transcends into her floral design and her love of all things paper are merged and she had taken “paper flowers” to new heights of Haute Couture. 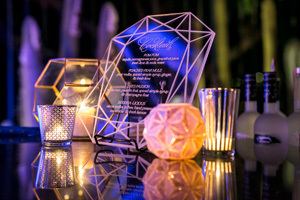 Her creations are being seen at event venues throughout Southern California for those wanting an original decor experience. The Bleu Dahlia specializes in custom paper flowers for all events to match your individual style aesthetics and colors. With a background in Graphic Arts, Anh also creates custom laser cut decor like table numbers, signage and cake toppers. I have a background in Art, I love to create one of a kind creations that is rarely seen repeated. I like to close my eyes to everything that’s happening around me and just create unique and beautiful floral designs, paper art and laser cut decorations. How long have you been working with flowers and your other crafts? I started working with flowers in 2006 at a high end event design company in Orange County. But my love of arts and crafts started in my early teens, I was always that friend that makes things for everyone! What style of design do you work with? I’m versatile, I just have a knack for making beautiful things. I love the bohemian hippie look and I also like modern and clean styles but I don’t have my foot cemented into any of these two styles. Rather, I float in back and forth within these two styles, sometimes into one side more than the other but never fully enveloping myself into either side. "Thank you so much for the beautiful custom cake topper and the 5 ft custom wood name cutout. They both were a hit and gorgeous focal points for our party. Thank you for your immediate response and for giving amazing customer service!" "Anh is a master at everything she touches! She only gets better & better. I absolutely adore everything she's made for me! I think it's going to look one way, and yet it always surpasses my expectations. Just trust her and you won't be disappointed!" "Her prices are so adorable. She's so creative and helpful and she responses as soon as she wakes up. She's reliable and she's on point. Love her work. It's amazing. Told all my friends and family about her."